2017 is a year of anniversaries in Europe. Almost arithmetic, we celebrate 15, 30 and 60 years. Of what? 15 years ago we began to use the euro as a single currency. In 2002 were 12 countries, but now moves to 19 States, with nearly 340 million inhabitants and is the second most used currency in the world. 30 years ago we launched what is perhaps the most successful and well known program of the European Union, Erasmus, which already have benefited nearly five million young Europeans. But the most significant anniversary is the 60 years of the Treaty of Rome, the official kick-off of the current European Union. 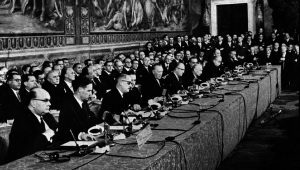 On 25 March 1957 Belgium, France, Luxembourg, the Netherlands, Italy and Germany signed the Treaty of Rome, which established the European Economic Community (EEC) and the European Atomic Energy Community (Euratom), and which have given rise to the current European Union. The heads of State and Government of the EU will meet tomorrow in Rome, where he will adopt a Declaration on the occasion of the anniversary. There will be also the presidents of the three institutions: Antonio Tajani, of the European Parliament; Jean-Claude Juncker, European Commission; and Donald Tusk, of the Council of the EU.